I find your magazine fantastic. I really look forward to receiving my copy every two months. Taking a bath in Japan is serious business. The Japanese bathtub, known as ofuro in Japanese, plays a role in three distinct aspects of Japanese culture: the private home, the public Japanese bath house, and onsen hot spring resorts. In each case the Japanese bath experience amounts to much more than simply washing off. Many Japanese people view sitting in their ofuro soaking tubs as a must-do daily ritual similar to eating or sleeping. For those individuals bathing is something that they must do to feel healthy and happy. Other Japanese people look at bathing as a social activity. Many parents bathe with their children, enjoying the experience and feeling it builds better relationships between family members. Even co-workers might bathe together when they go to an onsen resort on a company junket, or when they visit a hotel's sento public bath during a business trip. There are several differences between the Japanese bath and Western ones. Japanese soaking tubs are generally much deeper, so someone sitting in the tub can easily sink down with the water at chin level. Japanese bath water also tends to be much hotter than what Westerners normally find comfortable. The extra water volume (deeper tubs) and the hotter water temperature means that "conserving" the hot water becomes something of a priority. Japanese bathtubs are often installed in a fairly large room that has an alcove "changing area" beside it. There is never a toilet in the room with the bathtub. To most Japanese people it seems crazy - and even somewhat embarrassing - when Westerners put toilets in the same room where you are trying to wash.
Ofuro soaking tubs are usually surrounded by a tile floor and several tile walls. Fixed to one wall will be a shower with a flexible hose. There will likely be a wooden or plastic stool to sit on, and without exception there will be a drain in the floor between the shower and the tub. This floor drain is an extremely important aspect of the set-up. The floor drain is important for two reasons: First, the Japanese people soap down and wash off at that shower before getting into the tub. The dirty "waste water" flows off their bodies and down into the floor drain. Because the hot "soaking" water remains clean, a series of bathers can use the same soaking water throughout the day or evening. Secondly, the floor drain can easily catch any runoff from the tub. Bathers can fill that deep tub up to the brim, and if some water flows off, so what? The floor drain eliminates any need for a shower curtain or glass door enclosure. This makes the room feel expansive, and it allows for garden windows to be installed on at least one wall beside the soaking tub. Ofuro tubs come in many different shapes and sizes, but the general concepts described above apply to all Japanese baths. These include large sento public baths that can handle dozens of customers. It also includes naturalistic outdoor onsen baths where the hot water used in the bathtub is heated by geothermal activity. OFURO These articles discuss the Japanese bath as it is found in ordinary Japanese homes. These articles tend to focus on the differences between the traditional Japanese bath and the ordinary Western bathroom. If you are visiting Japan, or if you hope to have a Japanese bath in your own home, it helps to understand the Japanese tradition as it is found in millions of homes from Hokkaido to Okinawa. SENTO A few decades ago there were public baths called sento in every Japanese neighborhood. These baths played a significant social role in Japanese culture. They also provided a deluxe bathing experience. Each year there are fewer public baths in Japan's neighborhoods, but they can still be found here and there. These articles explain the sento tradition and how to enjoy a Japanese public bath when the opportunity arises. ONSEN Literally speaking, the word onsen refers to is a Japanese bath where the "soaking" water is heated by geothermal means. In other words, the hot water comes right out of the ground. As such, the water is often imbued with various minerals and aromas that some people feel are healthy. Some onsen are even thought to help the curing process for various diseases. ONSEN RESORTS The word onsen can also refer to a mountain resort where vacationers go to enjoy onsen baths. These are quite common in Japan, and every prefecture has one or more regions populated with ryokan hotels and onsen spas that are set in fabulous outdoor surroundings.. Visiting onsen resorts is a serious hobby in Japan, and various magazines and guidebooks exist to help vacationers decide where to visit. SIGNIFICANCE OF THE JAPANESE BATH In Japan the bathing experience involves much more than just getting wet and washing off. To many Western eyes the Japanese bath routine can seem almost seem like a ritual. These articles explain why Japanese people are so serious about bathing. OFURO TUBS These articles discuss the ofuro equipment and its installation. For example, did you know that almost all Japanese bath tubs have an "on-demand" hot water system that will automatically come on and "refresh" the water temperature whenever it falls below a certain temperature? These articles discuss the nitty-grity of the tub and its associated equipment. 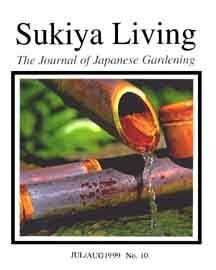 NATURALISTIC JAPANESE BATHS These articles examine some real life case studies of homes and inns where the bathing experience is surrounded by gardens and/or natural scenery. Most Westerners only dream of soaking in a tub while surrounded by a spectacular view of nature or by a beautiful garden. In Japan that experience is available for those who seek it out. These article explain what it looks like and how to make it happen in your own life.